I could never finish a whole one, myself. 15 Responses to Bad Signs, Cont. My inner grammar police just had a stroke reading that sign. Also, the eyeballs and the tongue…. Dude! You eat like a raven! Everyone is bringing up their personal shibboleths and obfuscating Jonathon’s modest proposal. I could never eat a whole child alone. With potatoes I might. One of my favorite rib joints has a big menu board over the counter where you order. Among beef ribs, pork ribs and other things on the menu are something they refer to as child ribs. I haven’t got up the courage to ask. Even when there’s room on the sign for “, and there are” before “Children”. Education in this country is trashed! Just as someone who plays around with type and design, I sob that this sign made it through whatever standards the issuer had. 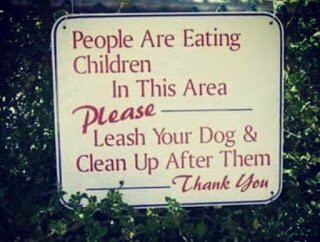 My kingdom for punctuation marks! Or for an editor who could have put the imperative at the top, and deleted the shaming! The dogs will be happy to clean up the leftovers. Well, that hit the spot! A happy meal of two toddlers and a rug rat. Now, my good man, would you be so kind as to leash your Schnauzer and deal with these bones?